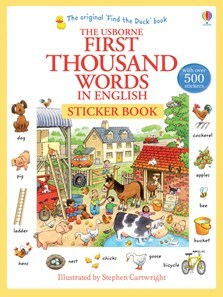 A sticker book version of the classic Usborne First Thousand Words in English, with over 500 colourful stickers which give learning an interactive element. Each sticker shows a picture with a word or phrase for children to hunt for and place on the correct scene. Provides a treasury of learning opportunities, from early reading and word recognition to spelling and dictionary use.